Originally published in 1856, "The Kidnapped and the Ransomed" is the personal recollection of Peter Still, a black slave. He was stolen as a child from his home in New Jersey, yoked to servitude for more than forty years in Kentucky and Alabama, and finally freed with the help of a pair of Jewish brothers. It is the only nineteenth-century slave narrative to show the participation of the Jews in the antislavery movement before the Civil War. The reader follows Still through a succession of brutal masters, a clandestine courtship, marriage involving separation, births and deaths, the formation of a daring plan for freedom, and harrowing action. No stage drama could be as wrenching as this true rendering of a slave's experience in America. Kate E. R. Pickard was in contact with Still while she taught at the Female Seminary in Tuscumbia, Alabama. Maxwell Whiteman was the archival and historical consultant for the Union League of Philadelphia and coauthor, with Edwin Wolf II, of The History of the Jews of Philadelphia from Colonial Times to the Age of Jackson. The original introduction by Rev. Samuel J. May, an abolitionist, has been retained. Description: "Mrs. Pickard's ability to turn Peter Still's life into a narrative that faithfully reflected the miseries and the horrors of plantation slavery places it among the outstanding accounts of slave life. "-Maxwell Whiteman, in his introductory essay. 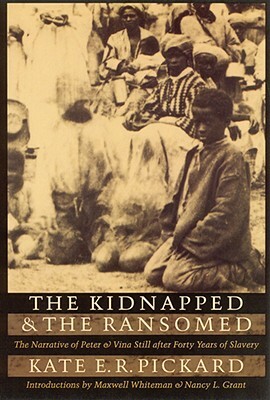 Originally published in 1856, The Kidnapped and the Ransomed is the personal recollection of Peter Still, a black slave. He was stolen as a child from his home in New Jersey, yoked to servitude for more than forty years in Kentucky and Alabama, and finally freed with the help of a pair of Jewish brothers. It is the only nineteenth-century slave narrative to show the participation of the Jews in the antislavery movement before the Civil War. The reader follows Still through a succession of brutal masters, a clandestine courtship, marriage involving separation, births and deaths, the formation of a daring plan for freedom, and harrowing action. No stage drama could be as wrenching as this true rendering of a slave's experience in America. Kate E. R. Pickard was in contact with Still while she taught at the Female Seminary in Tuscumbia, Alabama. Maxwell Whiteman was the archival and historical consultant for the Union League of Philadelphia and coauthor, with Edwin Wolf II, of The History of the Jews of Philadelphia from Colonial Times to the Age of Jackson. The original introduction by Rev. Samuel J. May, an abolitionist, has been retained. Introducing this Bison Books edition is Nancy L. Grant, a professor of history at Washington University, St. Louis, and author of TVA and Black Americans: Planning for the Status Quo. By: Ralph D. Kirkpatrick, Ph.D.